MacVector 10.5 is now available for download by qualified customers. To run MacVector 10.5, you must have a maintenance contract with MacVector Inc that was active on October 1st 2008, or have purchased an upgrade since that time. Please also note that MacVector 10.5 requires Mac OS X 10.4 or later. 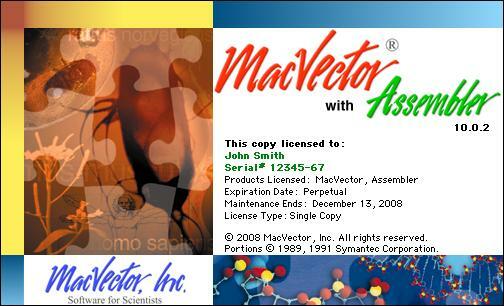 If your "Maintenance Ends:" date reads October 1, 2008 or later, you will be able to run MacVector 10.5. If not, you can register to download the trial version, then contact your local MacVector account manager (sales@macvector.com) to learn about upgrade options. All customers who are eligible to receive MacVector 10.5 will be sent CDs in the mail in the next few weeks. Alternatively, you can use this link to download the MacVector 10.5 updater.